I’m going to let you in on something. Part of my reasoning for going greener and especially for generating less waste is that I am hoping to take control of the clutter that dominates my house. Does anyone else have a counter that looks like this? Well, the rest of you are probably better organized. My husband has already stopped the credit card offers and pays most of our bills online, but we still end up with a mailbox full of junk! We frequently receive offers and catalogs for my deceased in-laws! 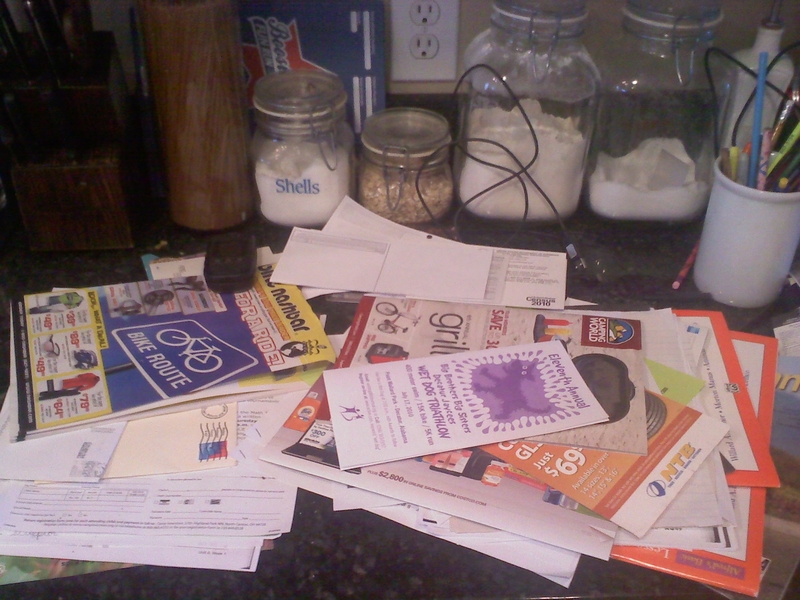 An additional frustration is that so much of the junk mail can’t be recycled. I found this site helpful: How to Get Rid of Junk Mail. I was surprised to learn that the Direct Marketing Association will help you reduce your junk mail! Register at their site and request to be removed from credit offers, magazines, catalogs and other offers. One pointer they had is that if you have ever purchased from a company you will have to contact them directly to be removed from their mailing list. Another option is 41Pounds. This organization will stop your junk mail for 5 years and donate a large chunk of the fee to community and environmental organizations.